An unprecedented feat was achieved Thursday evening in the heart of the Mission District. 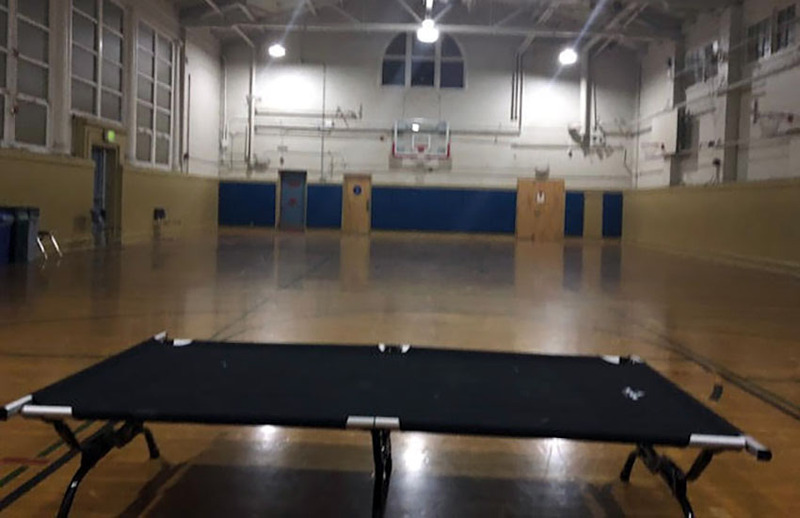 Buena Vista Horace Mann, a K-8 dual language immersion school, began providing overnight shelter at one of its gyms to some of its students and families who have experienced homelessness or housing insecurity. The pilot program will be fully operational soon, as the soft launch of the Stay Over Program began yesterday. By the end of the year, the school will host 20 of its students and their families, totaling up to 60 people. The principal said later that she did not greet the families, as she wanted to protect their privacy. The first cot. “To me, it’s evocative of hope and possibility,” said Principal Delarios Morán. Photo courtesy of Claudia Delarios Morán. Inspired by the K-8 public school, the Los Angeles Unified School District’s school board approved a proposal on Tuesday to investigate the possibility of housing their homeless students and families on school properties, while Dallas Independent School District opened a youth center for their homeless students this week. Such models reveal a need for innovative approaches in how public schools decide to best support their students and families, as the challenges associated with homelessness or housing insecurity affect many aspects of a young student’s life. “Our great hope is for our students and families who are experiencing insecurity to feel less anxious by knowing that they have a place to go that they can trust, where they can regroup and get the help they need to secure a home,” said Delarios Morán. At San Francisco Unified School District, approximately 1,915 students (of 54,063) identified as homeless in the 2017-2018 school year. Without reliable access to food, shelter and safety, students are often too hungry, tired and stressed to focus on their studies — leading to frequent absences in school and far-reaching implications on their academic achievement. The Stay Over Program was spearheaded by Ronen after administrators at Buena Vista Horace Mann proposed a solution last school year to address youth homelessness at their school. After Ronen and her staff secured funding for the pilot program through the mayor’s office, as well as through pro bono contributions, Dolores Street Community Services, a nonprofit organization, was selected through the Department of Homelessness and Supportive Housing to run the Stay Over Program. “The idea is that we’re not trying to add other responsibility on the school staff, but rather take away some of the work they’ve been doing so intensively around helping families deal with their housing situations,” said Goossen. 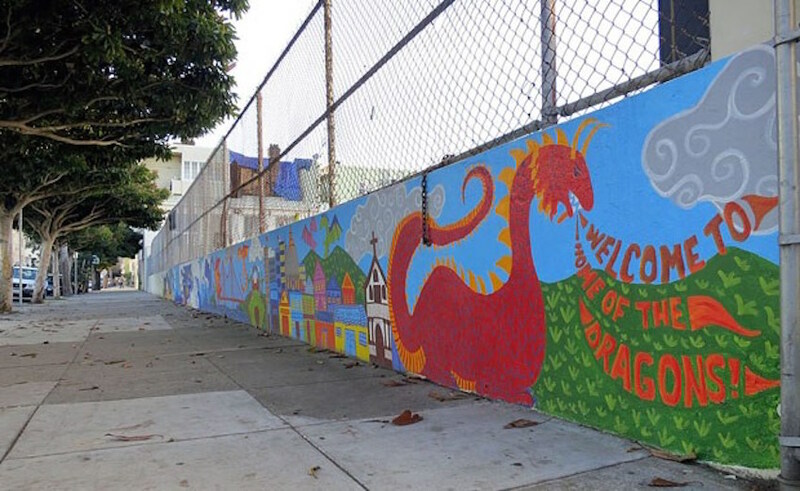 Located on the corner of Valencia and Liberty Streets, just a few blocks away from the school, Dolores Street Community Services has several centers located throughout the Mission District to better serve individuals with specific needs, such as homelessness, housing, immigration and employment. Community members are encouraged to reach out to Dolores Street Community Services, who marked their 35th anniversary this year, to coordinate volunteer involvement. And there’s no better time than now: National Homeless Youth Awareness Month. The Stay Over Program will operate from 7 p.m. to 7 a.m. on weekdays, well before the beginning of the school day, and until 10 a.m. on the weekends. Breakfast and dinner will be served to the families. As the Stay Over Program will only run through June, the challenge is that it will be harder to obtain long-term data to truly gauge the impact that the pilot program has on students’ academic development. However, throughout the school year, interviews with the students’ teachers, the school’s wellness staff, and parents in the program will be conducted to determine how the program is affecting the families, the students’ learning, and the classroom environment. They will compare that information to the experiences of families in congregate shelters, said Goossen, to help families exit homelessness and housing insecurity and into permanent housing. She noted that some of the participating families might have gone to emergency shelters in the past, while other families didn’t for a variety of reasons, as they may not have felt safe or comfortable going to those shelters, or due to lack of access. Minor adjustments were made to the school before the families’ arrival. Through pro bono services, an architect added extra lighting to ensure areas of the school are well lit. Additional pro bono efforts are underway to build a few more showers. The Stay Over Program is a noticeably collaborative endeavor. NextDistillations: A return to San Francisco’s greatest bar, Oddjob. How fortunate. Jennifer Cortez is a first-year student at UC Berkeley's Graduate School of Journalism. Prior to grad school, she was a high school teacher in the Coachella Valley.